Ethereum ETH/USD is trading at 125 and continues to move within the «Triangle» model. The capitalization of a digital asset at the time of publication of analysts is $13 212 199 349. The cryptocurrency is trading below the lower boundary of the Ichimoku Kinko Hyo Cloud. This indicates the presence of a downward trend by Ethereum. As part of the Ethereum Forecast and Analysis ETH/USD January 14, 2019, a test of the Ichimoku Kinko Hyo signal lines is expected to be near the level of 130. Where should we expect a rebound and an attempt to continue the fall of ETH/USD with a target below 100. An additional signal in favor of the fall of cryptocurrency will be the test of the resistance area. And also test the upper limit of the downward channel. Earlier, a weak signal was received for SELL the Ethereum cryptocurrency. The signal was formed due to the intersection of the signal lines at the level of 152. Cancellation of the Ethereum cryptocurrency fall will break the upper boundary of the Ichimoku Kinko Hyo Cloud and close above area 145. This scenario will indicate a change in the downward trend in favor of the upward trend and the continued growth of cryptocurrency. Expect to accelerate the fall in quotes ETH/USD stands with the breakdown of the lower boundary of the model «Triangle» and closing below 120. 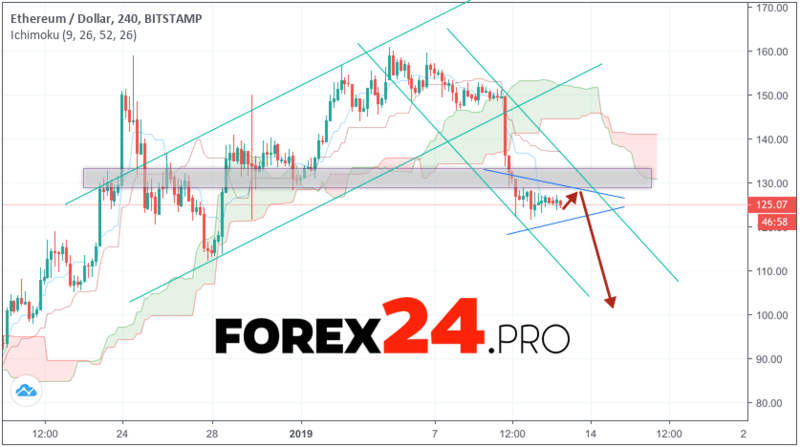 Ethereum Forecast and Analysis ETH/USD January 14, 2019 suggests an attempt to develop a cryptocurrency correction and a test of level 130. Where should we expect the continuation of Ethereum fall with a potential target near level 100. The strong growth and breakdown of the area 145 will cancel the fall option. This will indicate on the continued growth of the digital currency.